A super-GM who has consistently been among the world’s greatest players for over a decade, Veselin Topalov is one of a kind. He has played in three different World Championship matches, becoming the World Champion in 2005, and won countless tournaments featuring other top players. Always considered one of the toughest players to face in the world, Topalov has continued to astonish players with his continuous strength, not losing any skills despite having played the game for so long. Veselin Topalov learned to play chess at the age of 8. He was a chess prodigy who began working with International Master Silvio Danailov when he was 12 years old. Danailov continues to be Topalov’s manager to this day. Topalov became an International Master in 1989 and a Grandmaster in 1992. From 1994-2004, Topalov became one of the best players in the world. He came in first place in multiple tournaments all while playing against the strongest competition. It was during this time, in 1999, that he was involved in the game against Garry Kasparov which is generally considered one of the greatest games ever. 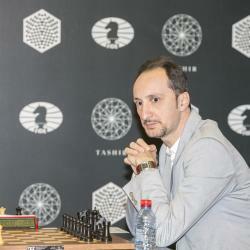 After these 10 years, Topalov began to start playing in matches for the World Championship. In the years 2005, 2006 and 2010 he played in a match to decide the World Champion. He became the World Champion in 2005 but lost his title against Vladimir Kramnik in 2006. In 2010 he played against Viswanathan Anand but also lost the match, despite it being a very close margin. He continues to be one of the toughest opponents to face in chess and is consistently ranked among the top 15 players in the world.